The SciVal API allows you to programmatically retrieve metrics for use in your own software applications. 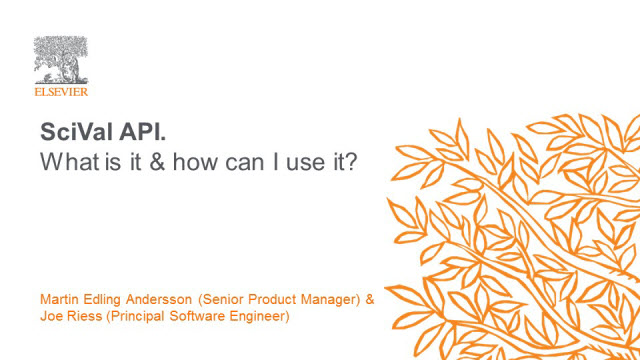 Join Martin Edling Andersson (Senior SciVal Product Manager) & Joe Riess (Principal Software Engineer) for an introduction to the new SciVal API, what it is, where it can be accessed and how it can be utilized. Joe, who built the SciVal API, will give a demonstration of how you can create a small application using the SciVal API and Scopus APIs together. An API stands for Application Programming Interface, and it provides a way for programs to talk to one another. The SciVal API gives access to a comprehensive basket of metrics for researchers (Scopus Author profiles) and all 8,500+ institutions available in SciVal. The API returns data machine-readable format that enables software, rather than humans using the scival.com platform, to use the data. Consequently, this allows developers to write programs that automatically extract metrics from SciVal periodically, and use that data in their Institutional Repository systems, websites and for richer visualizations in tools like Tableau. Each of the 96,000 Topics in SciVal are comprised of a collection of Scopus publications with a common, focused, intellectual interest. Since its launch over 1.5 years ago the Topics functionality has been refined to provide a host of benefits to help our users understand their impact in these areas of high momentum. Join us in this webinar to understand how you can make the most of these improvements and learn first-hand how a core SciVal user, Hansa Magee from Arizona State University, has been applying Topics to her work. Securing research funding is a growing challenge for universities and research institutions in the face of a hyper-competitive landscape. Research development professionals and research administrators need solutions that offer insight and intelligence into the complicated funding landscape, to discover opportunities that are the best match for their researchers and institutions, and to identify the best experts as potential collaborators and reviewers. Join us for a webinar to learn how Elsevier’s Funding Solutions portfolio can address these needs, equipping institutional research support staff with time- and effort-saving tools for identifying funding opportunities and experts. SciVal gives you the flexibility to analyze any researcher or group of researchers from any institution, create groups or even recreate your institution’s complete hierarchy with a few easy steps. • Do 'what if' scenario modeling. If I add a certain researcher to my team, how would my team perform? Join us live to ask your questions, or watch the recording at a later date. Identifying active researchers within a higher education institution is a challenge. Get to know how UNAB, Chile started using Pure as the central information repository to determine who are their active researchers. How the research administrators of The University of Groningen get data (quality) ready for reporting and what insights they get from Pure. Learn how Pure Awards Management Module has enabled Monash to streamline their business processes and capitalize from a more transparent and accessible interface. This has been done with focus on the full lifecycle of funded projects, including stakeholder management. Learn about the ambitions behind the special five university network site “ResearchwithNJ.com.”. An initiative to further boost the cooperation between business and research in New Jersey. : RTI International has been an avid Pure user since 2014 (need to verify this date). To maximize automation, they integrate different systems with Pure and deploy data extraction and reporting techniques that Pure makes available. This session will cover RTI’s research use cases and the efforts involved in achieving them with Pure. For a vast institute with dispersed resources, Penn State has strategically approached the implementation of Pure and carefully rolled out Pure across campuses. This session will cover their learnings, challenges and insights with this strategy and how they use Pure as part of the Elsevier Solutions Suite to tackle the research landscape at Penn State University. At last year’s Pure International Conference, you were encouraged to participate in a global Survey of Research Information Management Practices, jointly administered by euroCRIS and OCLC Research.. In this session, we will be sharing the findings from that survey, and with more than 300 survey respondents from 40 nations, with particular focus on findings relevant to the Pure community. Additional information is available at http://oc.lc/rim. Macquarie University implemented Pure in 2017 as the major component system of its new Research Hub. This session will showcase how the implementation of Pure has achieved greater transparency of the data relating to all research at Macquarie. We will also review how the Library and Research Services, as joint business owners for this new streamlined process, have established a closer way of collaborating and using their respective expertise to improve the data for internal and external reporting. The presentation will focus upon the highs and lows the University of Huddersfield has faced and the subsequent lessons learnt whilst populating Pure to ensure that quality data curation was achieved. This session will explore how the University of Birmingham have been working to address the challenges of an ever-increasing research information landscape; from the technical issues of a multiple system approach to whether the data we are collecting is able to support decision making. This presentation will discuss the approaches taken during the pure implementation in 2012 at The University of Bath. The expected and unexpected benefits that the integration with other systems has brought, and the impact it has had on the use of Pure and it data, and that of the other systems. Funding is a major priority for virtually all research institutions. However, securing funding is a time-consuming and increasingly competitive process. To succeed, you need to gain insight into the complex funding landscape, discover relevant opportunities, and make informed decisions. Answering the most pressing challenges researchers and research managers face, with innovative solutions that improve an institution's and individual's ability to establish, execute and evaluate research strategy and performance.